Bright-orange carrot sticks do more for your body than just add a crunch to meals. Carrots are a low-calorie food that also provides essential dietary fiber, making them a filling addition to any weight-management plan. Carrots also provide you with vitamin A and many minerals needed to keep your vision at its best and prevent nutritional deficiencies. Carrots are more than 88 percent water by weight, helping make them an excellent addition to weight-loss or weight-management routines as a high-volume, low-calorie food. From 1 cup of carrot sticks, you'll get 50 calories, 1 gram of protein and less than 1 gram of fat. The low-fat content of carrots complements cholesterol-lowering meal plans as well. According to a January 2010 article published in "The Journal of Urology," consuming a low-fat diet may also help to prevent prostate cancer in men. A cup of carrot sticks provides you with 12 grams of carbohydrate -- 6 grams come from natural sugars, and 3.4 grams are from dietary fiber. According to the Institute of Medicine, men need 30 to 38 grams of fiber daily and women need 21 to 25 grams of fiber daily. Although this fiber is indigestible by your body, it plays many roles in supporting your health. Getting enough fiber helps maintain proper digestion, may prevent colon cancer, and can aid in maintaining healthy cholesterol levels. According to a review of scientific studies published in the journal "Nutrition" in June 2004, a high-fiber diet may also aid in weight loss and help prevent obesity. Carrots supply at least a small amount of almost every essential vitamin. 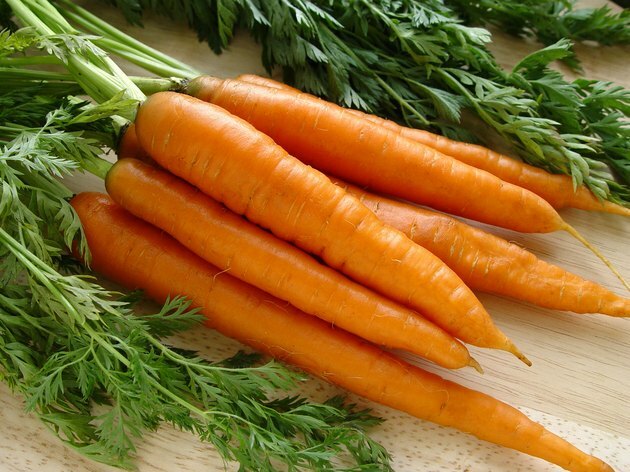 The most notable vitamin contribution from carrots comes in the form of vitamin A. One cup of the vegetable provides you with 20,381 international units of vitamin A, which is 408 percent of the daily value for the vitamin. Your body needs vitamin A for proper vision, immune function, reproductive health, cell formation and cell communication. It also functions as an antioxidant, helping to prevent cellular damage from free radicals. Over time, this may prevent certain forms of cancer and macular degeneration, according to the Office of Dietary Supplements. A November 2011 article in the "British Journal of Nutrition" notes that carrots may also help protect against cardiovascular disease because of their deep orange color, which comes from precursors to vitamin A called carotenoids found in carrots. In addition to fiber and vitamins, carrots provide you with minerals needed to keep you healthy. They contain calcium, iron, magnesium, phosphorus, potassium, copper and manganese. Among other things, these minerals help maintain bone and tooth health, proper muscle function and a healthy nervous system, and they also help with energy metabolism, protein synthesis, fluid balance and red blood cell formation. While carrots do not contain large quantities of minerals, eating carrots as part of a balanced diet will help you meet your daily mineral needs.